The rescued garden bench, as good as new! It’s constantly amazing to see the things that people throw away. A few months ago, we saw the wrought iron sides of a garden seat abandoned on the nature strip. The iron was a little rusted but still in pretty good condition, but clearly the wooden slats had rotted through. Instead of fixing the seat, out onto the street it went! It seemed too lovely a thing to go to waste, so I collected it as the basis for a good weekend project. The wrought iron sides, cleaned and repainted. The starting point was to clean the wrought iron sides. I could’ve done this with a steel brush, but used a fancy attachment to an electric drill instead. I then repainted them with a water-based paint that included rust inhibitor. Quick drying, this only took half a day of elapsed time. I’d measured up the slats on a friend’s similar garden bench, and new ones proved easy to source. Heading down to the local timber yard, I discovered the size I needed was pretty much the same as standard hardwood decking. That gave me a heap of wood options, and I ended up choosing ironbark, simply because I liked the deep red colour. These just needed to be cut to length, with three of the slats trimmed down to a more narrow width (for the first and last slats on the seat). The slats laid out for oiling. After drilling the holes for the bolts, I treated the slats with two coats of linseed oil. This is brilliant for outdoor use, and incredibly cheap. Some general stuffing around to bolt everything together, and the result is the seat shown in the first photo. It now sits at the bottom of the side garden, and it looks rather handsome. Total cost? Approximately $90 for the wood, $40 for the paint, and only a few dollars for the bolts. Call it $130 in total, which is a fair bit less than a new one, and the lovely wrought iron is saved for another generation. This entry was posted in Making our own, Saving the environment and tagged garden, garden bench, garden seat, wrought iron. On our recent visit to Tasmania we stopped in at Railton, famous for its topiary displays. While it is a smallish town, many of the residents and businesses have grown topiary so there’s plenty to see! One of the many topiary displays in Railton, Tasmania. 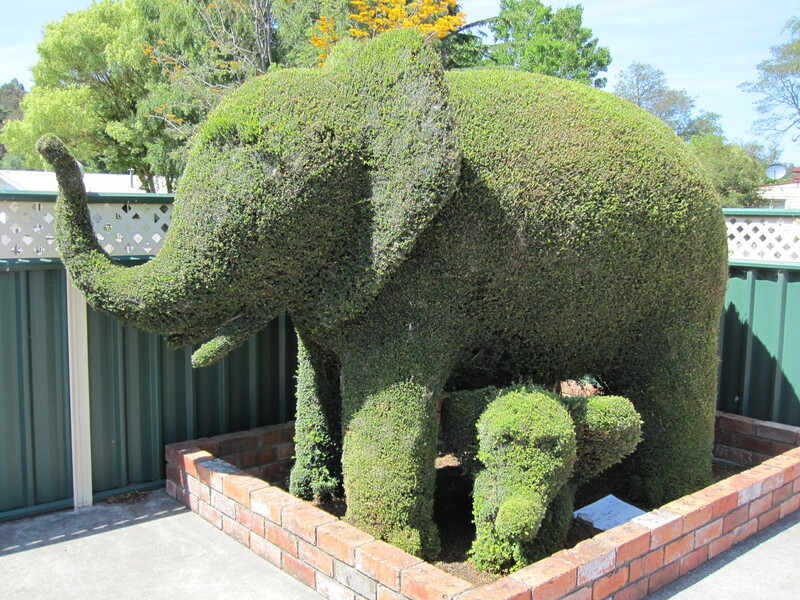 Elephants topiary in Railton, Tasmania. Our squirrel topiary — we have a long way to go! This entry was posted in General chit-chat and tagged garden, topiary. 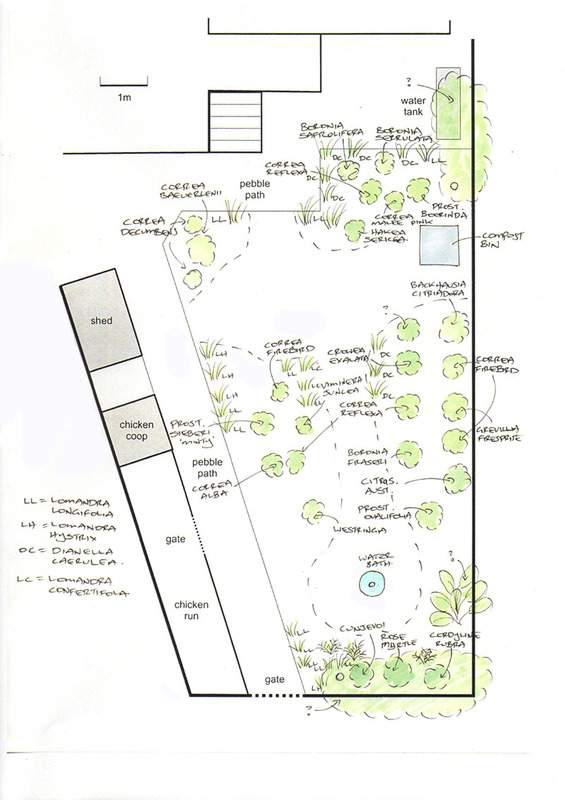 With a little bit of spare time in the lead-up to Christmas, I sat in the back garden and drew up a plan of what we’ve planted so far. As much as anything, this is to help us keep track of what’s in the garden. We’ll keep it updated as we plant new things. 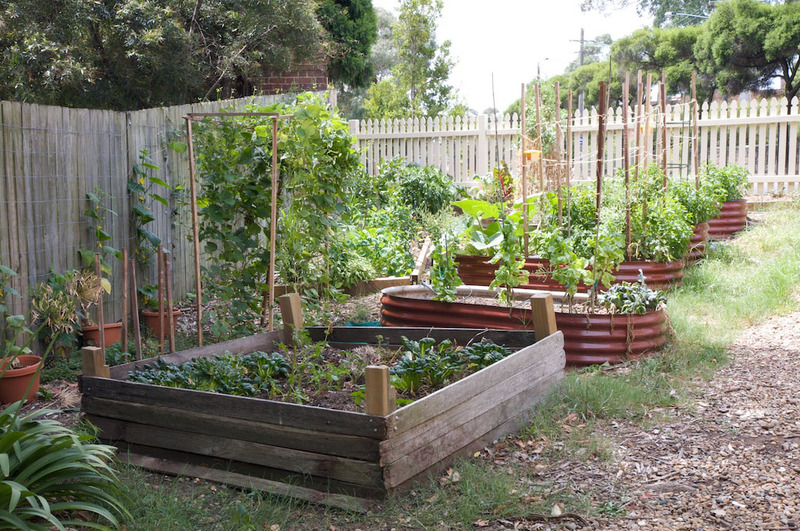 This entry was posted in Native gardens and tagged backyard, garden, native gardens, summer. I’m now four weeks into the part-time Winter Permaculture Design Certificate course being run in Sydney by Milkwood Permaculture. In addition to the course material itself, Nick and Kristen bring along a great library of books to browse through during the breaks. One that caught my eye was Create an Oasis with Grey Water by Art Ludwig.This is perfectly timed, as we’re half way through the design process for our house extension, and grey water was definitely on the list. I’d been looking into “standard” approaches to grey water, and wasn’t very impressed. The basic design is to connect up the washing machine to a small-ish under-floor holding tank. A pump then extracts the water and sends it out to drip feeds throughout the garden. Health department regulations prevent the water from being held for more than 24 hours, adding complexity to the system. With tanks and pumps, there needs to be filters, maintenance and careful use. These systems also aren’t cheap. Having a casual chat to my friendly water tank folks, they quoted a figure of $3000-4000 for an installed system, including all the extra plumbing. Washing machine: yes, assuming that suitable washing powders are used. Hand basins: yes, but why bother, doesn’t produce much water. Shower: NO, produces too much water, would overwhelm the drip feeds. Dishwasher: NO, too much solid matter. Kitchen sink: NO, too much solid matter. So that’s $4000 for a system that diverts perhaps 200L of washing machine water into the garden once a week. Hardly seems worth the effort! The grey water book listed earlier outlines a very different approach. The big advantage we have is that our back garden has a fairly substantial slope, meaning that gravity can do all the work. All relevant grey water sources (washing machine, dishwasher, shower, sinks) are piped to a single location under the house. The water is carefully split into as many feeds as required. Instead of using drip feeds (which block and only support low flows), the water is directed into mulch-filled basins. These basins feed trees, which can soak up a lot of moisture. The rest is absorbed into the ground, for the benefit of the rest of the garden over time. The big benefit of this approach is its simplicity. From what I’ve read, it takes a lot of careful up-front design, but after installation it runs itself. No pumps, filters or maintenance. It will cope with large volumes of water, even when the ground is already wet. I’ll work these out over the next few weeks, and will blog the results. Then I’ll start liaising with the plumber and architect to work out how to factor it into the building designs. In the meantime, the Laundry to Landscape© Grey Water System page outlines a simple approach that can be taken by almost anyone to make use of the washing machine water with little or no effort or cost. This entry was posted in Renovating the house, Saving the environment and tagged branched drains, drains, garden, grey water. 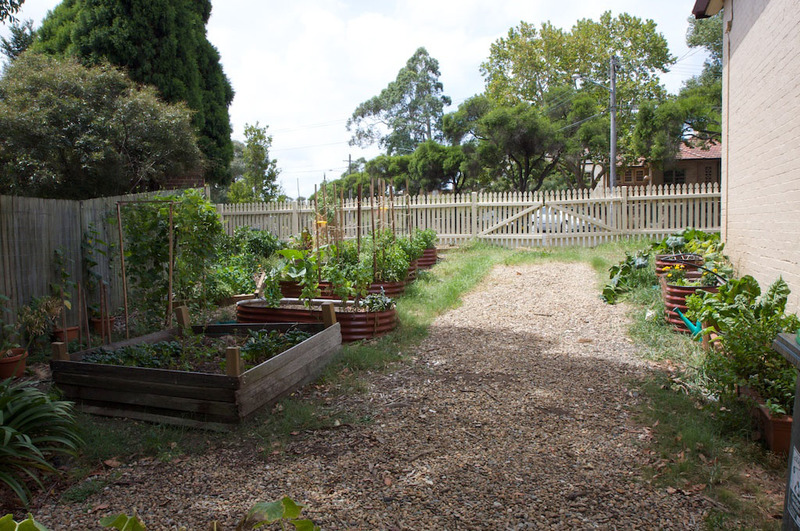 I’ve had a few comments from blog readers asking for a view of the whole vege garden. So here it is! As mentioned in earlier posts, all our vege gardening happens at the front of the house, as this is where the sun is. It also makes great use of the odd triangle of land beside our house, even if it means working on a slope. The best thing, though, is the conversations it generates with other local residents, or general passer-byers. As a novice gardener, I’m still getting the hang of timing, so I don’t feel that the space is being fully used yet. (I seem to have at least one fallow bed at any given point.) Still, not a bad collection for a tiny suburban space! 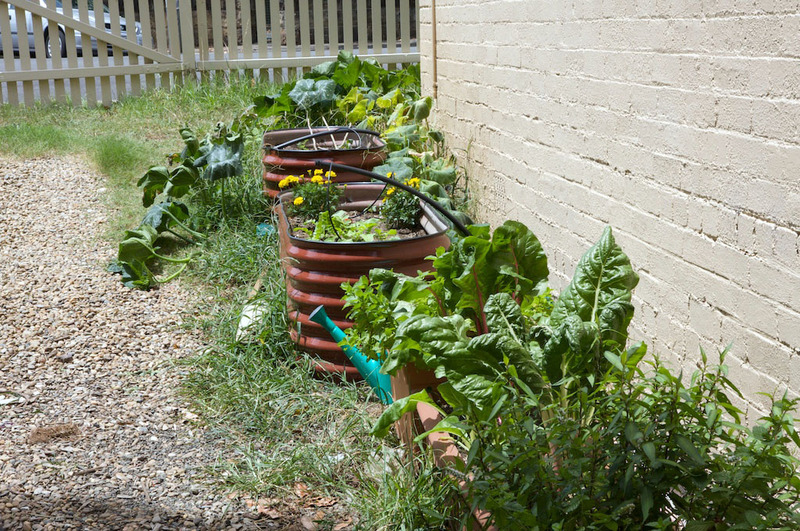 This entry was posted in Growing our own food and tagged garden, snapshot, summer.